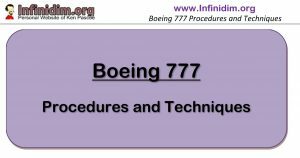 Any long haul pilot is well aware that changes in the weight of the aircraft at takeoff have a significant impact on the fuel burn of the flight. This includes changes in Fuel as well as Payload. For example – If I decide that I want to carry an extra 2000 kg of fuel from Los Angeles to Sydney for holding purposes (which is less than 20 minutes or 4 holding patterns by the way), then apart from the holding fuel – I’ll need to load an extra 900 kg of fuel – to carry the extra 2 tons. As such – I’ll need to load almost 3000 kg of fuel in order to be able to carry out 4 holding patterns prior to approach into Sydney. Has anybody mentioned this to Sydney ATC? The correction required is partly based on the weight concerned, partly based on the length of the flight. Our flight plans come with a correction figure to allow us to calculate the change in Fuel Burn that results from a change in Take Off Weight – assuming the weight is being carried to destination – it’s called the the LNDG correction figure. For example if the payload of the aircraft increases by 1500 kg and the LNDG correction figure is 500 Kg/Ton – I’ll have to add 750 kg to the refuelling figure to cover the increase payload. Note that this 750 kg not only covers the 1500 kg of weight – but the overall increased 2250 kg total weight of the aircraft. Confused? Read On. Recently we’ve been having fun in Abu Dhabi with restricted take off weights due to the high ambient temperatures. This has necessitated some fast figuring on the backs of the flight plans as well as some quick SATCOM calls to Nav Services. 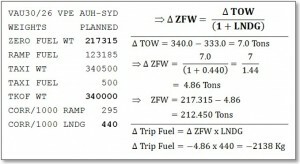 And it has renewed my interest in a technique that our ex-Cathay pilots have shown us on how to use the OFP LNDG correction figure to calculate a new limiting ZFW based on a force TOW change. Time to write it into the P&T. Practices & Techniques : 8.25 Using LNDG To Calculate A Change in ZFW based on RAMP Weight Change. The OFP LNDG figure can be used to calculate a limiting Zero Fuel Weight (ZFW) based on a required change in Takeoff Weight (TOW). While significant changes in weight should trigger a request for a new flight plan calculation – when a performance limited takeoff weight requires the quick calculation of a new ZFW, crew can use this technique to calculate a reasonably accurate figure. The formula uses the difference in TOW and a figure of (1 + LNDG); all calculations are done in Tons to keep consistent. The mathematical basis of the calculation is similar to removing a previously applied percentage by dividing – rather than subtracting. The 7 Tons is divided by (1 + 0.44) to give a 4.86 ton change in ZFW. This results in a limiting ZFW of 212.450 tons. 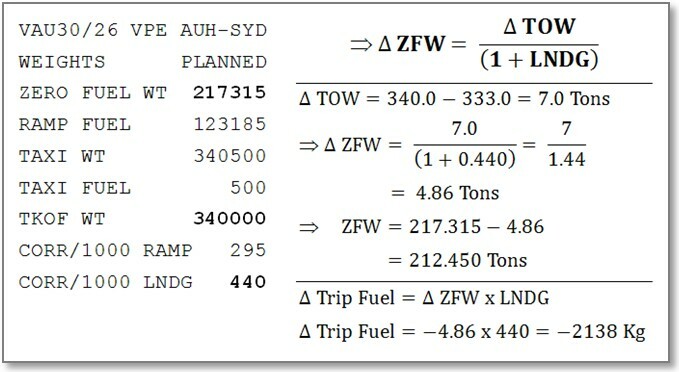 An additional calculation will be required to calculate the change in Trip Fuel associated with the ZFW reduction. In this specific example, a re-run of the OFP using the same parameters results in an accurate ZFW of 212.877 Tons – the manual calculation is out by only 420 Kg over a 7000 Kg change. Remember that the RAMP/LNDG figures lose accuracy over large weight changes. Changes (outside ± 3 tons of ZFW) may prompt the crew to contact Nav Services for an updated OFP Calculation.